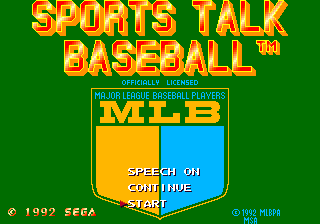 Sports Talk Baseball is a 1992 baseball game by Sega for the Sega Mega Drive released exclusively in the US. It takes Pro Yakyuu Super League '91 and replaces the music with a running commentary in the style of Joe Montana II Sports Talk Football (done by various Western Technologies employees). Sports Talk Baseball is licensed by the Major League Baseball Players Association so includes real players. It does not, however, have a full Major League Baseball license, so teams are referred to by cities or states. Main article: Sports Talk Baseball/Magazine articles.